Since I’m on vacation down in beautiful Costa Rica, soaking up so much sun. I actually think that I’m going to turn black by the end of this. It’s so amazingly gorgeous though I actually might never ever leave. As you know from reading my Stance review, I’m totally staying committed to my training down here. Well, it doesn’t feel that way as I sit by this pool eating chicken and french fries, but, hey. I’m on vacation. I have to let my body reset a little bit right? I’ve actually found that when I’m a little more relaxed with my diet I end up feeling way healthier and super refreshed than when I stay super strict and don’t eat anything ‘dirty’. And ‘dirty’ means fried food, cheese, sugars, sweets…you know. Pretty much anything that tastes good. But let’s get back on topic. I was on Insta on the beach when my super good friend Becca was like ‘you gotta follow this guy Andy Frisella, he’s super motivational and inspirational!’ I obviously looked him up and found him quickly because we all know that sometimes we all need some extra motivation before a tough challenge- be it a workout, test, speech, or whatever. Some people are super inspiring, and as it turns out, this Andy Frisella guy is exactly that. He posts a lot of standard ‘rich guy’ stuff like pictures of his cars and stuff—which usually rubs me the wrong way because who likes to have rich people just rub it in, right? But Frisella always types out some very motivational stories and principles that have helped him get to where he is. The combination of being able to visualize his success and then have the voiceover to back up how he got there has been very powerful and impressive to me. He also will often post videos of him talking about his sources of motivation and how you have to be strong enough to ignore the people who try to hold you back. I highly recommend you find him and give him a follow. But now let’s talk a little bit about one of his best-selling products from his company, 1st Phorm. 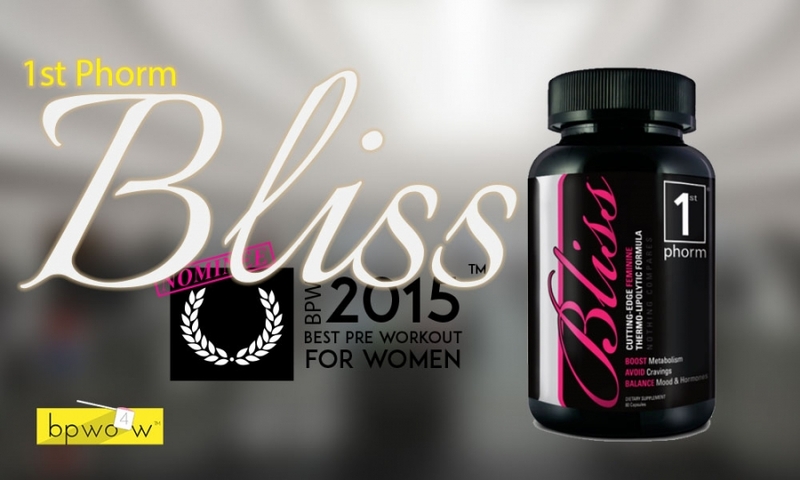 The Bliss fat burner for women is clearly 1st Phorm’s female targeted product that they claim will increase your core body temperature, burn fat, eliminate cravings, boost natural energy levels, and even ameliorate the effects of PMS, mood swings, water retention, and even menopause. This all sounded VERY far-fetched to me when I got the product. I want to make the focus of this review on the fat burning and elevated metabolism aspect of the product because let’s face it. We aren’t seriously going to buy Bliss thinking that it’s going to stop PMS or mood swings or menopause. Like. Seriously. It just isn’t going to happen. But can it really help us burn a little bit of extra fat? The answer is- kinda. Me: For me, 1st Phorm Bliss was a really inconsistent fat burner. The product starts off awesome for the first couple of days. You end up getting a very dry, lean look all throughout your midsection, face, arms, and legs. I think this is because Bliss makes you drop some water right away. I’ve never been a fan of ‘diuretic’ products, but I don’t think Bliss is really made just for those purposes. I did like how it gave you a similar effect as these products though. What I did not particularly like about Bliss was that it really seemed like the effects lessened as the two weeks went on. If you remember from math class there is such as a thing as a point of diminishing returns. Or was that one of those impossible economy classes in college that I’ve tried to erase from my memory? Who knows. But the product definitely loses a little bit of it’s fast and furious pace at which it SEEMS to work in the beginning. I hit such a wall with Bliss that I felt like stopping taking it because it literally was doing nothing for me. Oh. And if you’re expecting Bliss to cure your PMS or mood swings or anything of the matter- I can tell you it most certainly does not. I know. Talk about an awful time of the month. On vacation no less. Are you kidding me. But getting back to the results. I guess by the end of the second week I WAS looking leaner. But it was the same exact look that I achieved after the first 72 hours of taking it. I also noticed that once I stopped talking 1st Phorm Bliss, that super-lean look went away very quickly. It’ll be interesting to go over the ingredients now and see if we can figure out just which of these ingredients might be responsible for giving the fast action result, but then sort of petering out. Becca: I liked 1st Phorm Bliss but not for the reason that you might expect. I do tons of yoga and found that 1st Phorm helped me to ‘phocus’ (Allie made me say that) during those sessions. I actually did not notice very much fat burning or fat loss from taking this product but I also don’t know if two weeks is long enough for a fat burner to work on your body. I’m probably 4 or 5 lbs. heavier than I want to be and absolutely wanted Bliss to be the magic pill that it seems to be on the website. I guess I’ll just have to keep waiting for my magic pill. Diarra: Allie is always trying to get me to take these products and wouldn’t you know it I finally cave. On vacation. I tried the 1st Phorm Bliss for like ten days but stopped because I didn’t like the feeling that I was getting from it after awhile. I was feeling a little bit over-energized to the point where my stomach was just too much on edge for comfort. I’m also a big coffee drinker so I didn’t want even more caffeine in my system. I don’t know exactly how much caffeine was in here, but after taking one of those pills you feel like you just drank about 3 cups of coffee. I wasn’t digging it at all. Of all of this very extensive list of ingredients, I like the ashwagandha and the synephrine most. Synephrine is what gives Bliss the focus element that Becca noticed, while synephrine added to the effects. I’ve also become quite fond of picamilon, which can also give a sort of dialed-in or goddess-like feeling. If I had to knock this formula in any way, I’d have to say that the quantities are a bit too small. For a one pill serving, even the ‘good stuff’ ends up being pretty dramatically under-dosed. Namely the green tea. Other than a pretty impressive ingredient list, Bliss also boasts some of the neatest packaging that I’ve seen in awhile. I’ve been getting so much nicer with my packaging grades and I’m not sure how I feel about it. It’s like my critical eye is softening with age or something. 1st Phorm Bliss is a perfect case of this. Usually I’d complain about the rotated product name, and the cheesy cursive font that is supposed to tell us all ‘hey this is for you, girls!’ But today I’m not going to do that. Today this packaging is actually super nice looking. To start with, the 1st Phorm logo is really cool looking. The shade of pink that they chose for that rotated product title is not too hot to be obnoxious, and does a good job standing out against the black backdrop. The sans-serif fonts are easy to read and give you a good idea of what this product does without being over the top. This isn’t the most complex design that you’ve ever seen, but it’s actually a nice piece of design if you think about what the role of a package label is. Do you know without a doubt from one glance what the name of the product is, and what brand makes it? Absolutely. Is it pleasing to the eye to look at? For sure. That’s all there is to it, folks! Let’s wrap things up with a few final words and a final review grade for Bliss.